How are you doing? Have you done all of the things you set out to do this month? Are you claiming the mantra: February is the new January? It’s true you know! There is nothing magical about January 1st. February 1st is just as good of a starting day. As is any Monday. Not so sure about Friday but thanks be to God his mercies are new every morning. We can have a fresh start anytime! We just have to claim it. I have been amazed! This has been my best January ever! Did I accomplish everything? By no means! But I have established some good habits and accomplished many things that I wanted to accomplish. There are a couple reasons why I think I have done better this time around. One is PowerSheets! I know I keep raving about them but they really helped me to process what is important to me and why and that has motivated me to keep practicing. Another thing is that I have come to realize that during this season of life my goals need to be more of a crafting of my daily life and habits than big projects. The final key to my success the last couple years is tracking! 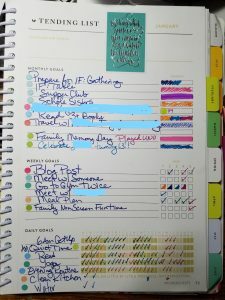 I have made habit trackers in my bullet journal and also used the Tending List in the PowerSheets. It really helps me stay on track and/or realize that I may need to re-evaluate what I am trying to accomplish if I am consistently not following through on particular items on my list. It just may not be the season for that thing. So what have I been successful at? I have gotten up at 6 am almost every weekday this month. I have done yoga every single day this month!! (Guys this is amazing! I have never done something every single day without missing, ever!) I have read my Bible almost everyday. I’ve also read a book nearly everyday. Most evenings I have sat down and reflected on my day and checked my schedule and created my to-do list for the next day. I’ve worked on building community and spent special time with my family. What have I missed? I have not been getting nearly enough steps in. (But it is January and there is a sheet of ice covering the ground outside.) I have not drank enough water. And my kitchen is still dirty almost everyday when I call it quits for the day. I am still a work in progress and I am ok with that. At least I am making progress! I hope you are finding your groove and building a life for yourself that provides happiness and meaning. May the God of hope fill you with all joy and peace as you believe so that you may overflow with hope by the power of the Holy Spirit.